Lakeshore Cantilever Pontoon lifts are ideal for those who do not need a permanently-attached canopy frame (but freestanding canopies are available) and dock their boat in less than four feet of water. Cantilever pontoon lifts are the best value in pontoon lifts alongside a dock. 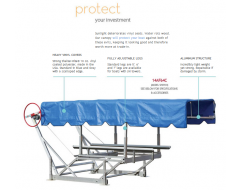 Optional Leg Extensions and Stand-alone canopy systems available. The Cantilever Pontoon Lift category offers cantilevering lifts that run almost the entire length of your pontoon and lift from beneath the deck or your boat. Innovative design, extends out 29" from the lift, to allow easy cranking from the dock. 32" diameter wheel is powder-coated for a durable finish. Heavy duty winch has greater strength and dependability than lightweight "trailer" type winches that other manufacturers use. New design allows winch to be positioned on either side of the lift. White polyester rollers gently guide your boat onto the lift without damage or marks. Designed to evenly support the deck of your pontoon boat along the entire length. This protects your pontoon boat from deck fatigue.